The Winter Garden Square [H5734] - $13.00 : Yarn Tree, Your wholesale source for cross stitch supplies. Cross stitch pattern by Carolyn Manning Designs. 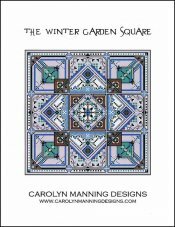 Take a look at these beautiful winter squares that make up "The Winter Garden Square," design. Hues of green, blue & white are stitched throughout each square. We can't hold back anymore, let it snow! Stitch count 196w x 196h.